Q: My snake regurgitated! What do I do? A: This is without a question the biggest problem that most people will face while owning their snake. I will give my opinion on this, but at the bottom of the page are FAQ's on this subject by Kathy Love---PLEASE read that also. First off you should try to figure out why the snake regurged it's meal. Was the food item too big? Not totally thawed? Improper temps? Check all of those things so you do not make that same mistake again. 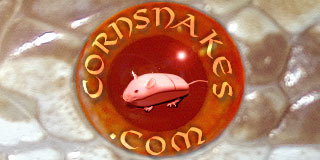 Wait between 8-10 days and feed an item smaller than what your snake is currently eating. For example, if your snake is on fuzzies and regurgiated, drop down and feed pinkies. You can also place a few small cuts in the skin to aid in digestion after a regurge, or all the time. If it keeps that down, great. I'd suggest for the next two feedings to keep with a smaller prey item before going back to the regular sized items. If the snake regurgitates it's next smaller meal right after the first regurgitation, then please skip down to the bottom and read Kathy's FAQ. Q: Help, my snake isn't eating! A: Relax, and don't worry just yet. Double check your temperatures to make sure that they're not too low, or too high. Many people do not realize that high temperatures are just as big of a problem as temps that are too low. Extremes in either direction can create stress and make a snake not want to eat. If the temps are correct, make sure the food item is thoroughly thawed and warmed to the proper temps. Once you do that, try feeding in a smaller cage and putting a towel over the feeding cage and leaving the snake alone for at least a few more hours. If that does not work, you might consider feeding your snake a live mouse. Even though I feed live, there can be problems associated with this. It is perfectly fine to feed live pinkies and fuzzies, but I would encourage you to feed a pre-killed or stunned mouse that is actively walking around with it's eyes open. Anything past the fuzzy stage can and will bite. Better safe than sorry. Q: How do I know when to move up to the next size mouse or rat? A: Move up to the next sized prey item when you do not notice a visible 'lump' after 24 hours following a feeding. There should be a lump visible between 24-48 hours after any feeding. Also remember, feeding items that are over 1.5x the thickness of the snake can cause problems. Try not to feed any items that are larger than 1.5x the thickness of your snake. Q: Is it normal for my male snake to stop eating in the Spring? A: Absolutely. Love is in the air, and eating is not the first thing on their mind. It is very common for male snakes to go off feed for several weeks and even sometimes months during the mating season. This is especially true if you brumated your male. Q: My adult female stopped eating, is this normal? A: If she is gravid, it's quite normal. Most females will go off feed once they're gravid. Q: I think my snake might have injested some substrate, what now? A: Well, there's not much you can do besides from hoping that the item passes and the snake doesn't become impacted. If an impaction occurs, it's time to schedule a vet visit. Q: I think my snake might be starting to shed, but I'm not sure. How do I tell? A: First, your snake will begin to appear lackluster and dull. The colors will start to fade and on most snakes they will have a waxy looking tint to them. Their belly checkers (provided they're black) will look milky and their eyes will blue. If their eyes are blue, that is called 'blue phase'. After the blue phase, their eyes and skin will clear up and they will shed within 3-7 days, or thereabouts. Q: Okay, my snake shed, but not all in one piece--what's wrong and how can I fix it? A: This is one of the easiest problems to fix, so worry not. Bad sheds are caused by low humidity. So, you need to figure out what the humidity level is in your cage. You can either buy a dial like hygrometer from a pet store, or buy a combo humidity/temp guage from stores like Walmart. They are normally around $5 for the dial types, and $15 for the dual digital humidity/temp guages. Obviously digital is better, but both work. You are looking for humidity between 40-50%, give or take. Once you notice your snake start the shedding cycle, you can mist the cage once or twice a day to increase humidity or create a humid hide. Bigger water dishes also create more humidity. If you have a screen lid on a glass aquarium, you can place a towel of half the top to help keep some humidity in. Q: My snake shed, but there is a piece of shed skin still stuck on the tail. Do I need to get this off, or can I just wait until after the next shed? A: No, you need to get that off. Shed skin becomes tight and constricts where it is left after a shed. If the very tip of the tail does not shed properly and is not removed, it will constrict the flow of blood and kill the tip of the tail. You can either place your snake in a damp pillowcase for a few minutes, place your snake back into it's cage with substrate removed and replaced with paper towels or newspaper and a damp crumpled paper towel, or (and my suggestion) get a damp facecloth and let your snake 'crawl' through that until all of the skin comes off. This works very well for retained shed patches of skin that have not come off as well. Q: My snake injured itself somehow in it's cage, what can I do? A: If it's just a minor injury you can mix a 50/50 solution of hydrogen peroxide and water and apply that to the area serveral times a day. Also, change the substrate to paper towels or newspaper to try and avoid possible infection and irritation from other substrate. If the problem is major then please seek a vet. You can also dab on some bactracin or neosporin. Q: I see several small block dots moving on my snake--what is that? A: Welcome to the wonderful world of snake mites. They are the most common parasite that you will encounter and one of the biggest pains to get rid of. I have personally used Sevin Dust without a problem, but some people recommend a diluted Nix treatement. Since I have no experience with that, I will just link some threads regarding the issue. I suspect your problem is probably not bad mice, but about handling too soon, feeding too soon or too large of a meal, a stomach "bug", or improper temps. If you make these mistakes once, or even twice, it is not usually a problem if you FOLLOW MY INSTRUCTIONS EXACTLY. But remember, each time it regurges, the stomach acids are depleted, and the whole electrolyte balance is thrown off more and more each time, and it makes it MORE likely that it will continue to throw up until it dies. (those consequences are just my opinions - I do not know if science backs up my conclusions, but my experience certainly does!) That is why it is so important to NOT ALLOW another regurge. The next month or two is crucial. DO NOT feed it for AT LEAST 8 days since the last regurge. NOT ANYTHING AT ALL! Then get a newborn frozen pinky and cut it in half (or cut off just the head) If she eats it, leave her alone for a whole week. (no handling). Repeat the partial pinkie feeding the following week. Then feed a whole newborn pinkie a week after that, if there has been no regurge. Leave alone for a whole week. If she regurges, wait a week and repeat 1/2 pinkie. If she keeps it down, wait a week and repeat whole pinkie. If she holds down a couple of meals, DO NOT rush back into larger meals and more handling. Treat this seriously. Go very slowly. After 3 successful meals, go to a newborn pink every 5 days. Go back to normal feedings only after 6 successful meals. Always wait to handle until after 3 or 4 days, but only AFTER 6 successful meals. No handling until then (causes stress, need to keep stress down). And NEVER feed again right after a regurge - ALWAYS wait AT LEAST 7 or 8 days, maybe even up to 10 days, and then only feed something that was about 1/2 the size (or less) of what she regurged..
Also, be sure that temps are not too warm or cool. Try to give an area of low to mid 80s on one side and 70s on the other. Too hot or cold will cause regurges. The number of days and amounts of food, etc, suggested above are not set in stone. Other people may have success with slightly different formulas, but this is what I found works for me and many of my customers. If this protocol does not work when carefully followed, it is likely that the snake has some severe problems. Your only hope is a QUALIFIED herp vet, who may or may not be able to save your pet. Please follow my care sheet for the first month or so when starting with new acquisitions (posted on my website for the first month's care of new corns).. The first month is crucial in getting the baby established. It is worth a little extra "coddling" for the first month in order to have a trouble free pet for the next 10 or 15 years or more. There are lots of tricks for getting babies to eat - some are mentioned in the Manual. Feeding in a little deli cup is one of the first things to try. Some will only take live, or lizard scenting. Some want you to cut the frozen pink in half, then put both halves in the deli cup. Sometimes non feeders start feeding after bumping them around on the way to an expo. Some people have had luck dipping pinks in chicken broth, although it has not worked for me. Or try tease feeding as mentioned in my book. As a last resort, force feed and then brumate them until spring and see if that makes a difference. Try all of these things, starting with the easiest and least invasive, working your way up to the force feeding if needed. i have a total of 19 that hatched 8/26 they were from a clutch of 23 out of the 19 i was able to get 8 of them to eat the first time about a week ago finally the other 11 i still have had no success i have tried to even force them and when i place them back into the deli cup the release it and coil. starting to get concerned that they may not survive. i saw some suggestions here to try has far has live. is it true that once given live they will not eat frozen. going to try the live and the cutting in half once and see if that may help. ok thanx mate. never had a snake before so everything is new to me! This thread isn't really for discussing feeding problems. Please read (and try) all the tips above, and if you still have questions, search around for other feeding threads or start your own new thread.